The bowl is simple enough, very dark with burnished surfaces and relatively crude lattice-pattern decorations. Yet, because of the context in which it was found, this everyday object is extraordinarily eloquent. 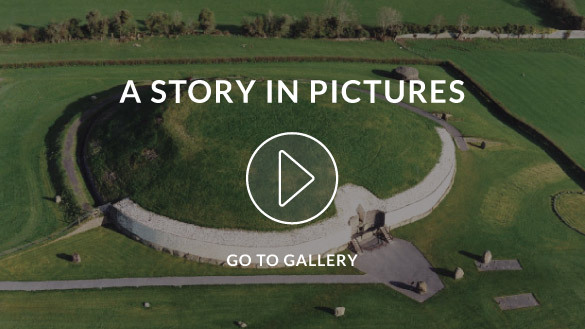 It tells us a great deal about the lives of some of the earliest Irish farmers. The bowl is simple enough, very dark with burnished surfaces and relatively crude lattice pattern decorations. It may have been used for drinking, and similar vessels have been found elsewhere in Ireland. Yet, because of the context in which it was found, this everyday object is extraordinarily eloquent. It tells us a great deal about the lives of some of the earliest Irish farmers. It was discovered in 1992 along with remains of three other pots, in a small cave in Annagh, in the east of Co. Limerick, that contained three full human skeletons, two other sets of partial remains, various animal bones and a flint blade and arrowhead. The bowl and pots tell us that the people were farmers; the other objects tell us that they were also hunters and warriors. Thus, this ancient grave offers two major revelations. One is that the development of agriculture was accompanied by considerable violence. The men who were chosen for burial at Annagh seem to have been veteran local champions or heroes. Two of them were in their 50s when they died — perhaps 20 years older than the norm. All three had suffered violence: two had serious head injuries, one a broken nose, one a fractured rib. In one case, the blow to the skull was delivered with such force that it must have been inflicted by something like a slingshot. Beside the plain domesticity of the bowl, there are the vestiges of brutal struggles. The other thing we learn from Annagh is that the transition to agriculture did not happen all at once; socially and culturally people retained their links to an older, wilder way of life. Clearing land was hard work: the skeletons show the wear and tear of vigorous lives and the carrying of heavy weights. This hard-won territory had to be defended, and conversely offered an attractive prize for outsiders. The grave at Annagh dates from around 500 years earlier than the great Neolithic passage tombs such as Newgrange, but it may reflect the continuation of even older cultural practices. In this regard, the careful arrangement of hunter’s apparatus (blade and arrowhead) with a selection of animal bones is particularly resonant. The animal bones were brought specially to the cave, and they represent both the old, wild world and the new order of agriculture. There are bones from a bear, a wolf, a wild boar and a deer — creatures of the forest. There are also bones of sheep and cattle — the domestic beasts raised by farmers. Raghnall Ó Floinn of the National Museum, who led the excavation at Annagh, believes that this arrangement is deliberate and indicates a culture that is still in the midst of a long transition. Farming was the dominant way of life, but the call of the wild was still heard. Even as they cleared land and herded cattle, these local heroes may still have thought of themselves as proud hunters.